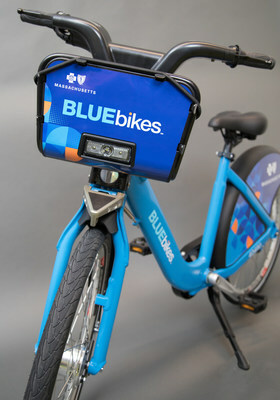 BOSTON, May 9, 2018 /PRNewswire-USNewswire/ -- Residents will get their first look today at the new Blue Bikes about to hit the streets of Boston, Cambridge, Brookline and Somerville, as part of the Metro Boston public bike share system's new partnership with Blue Cross Blue Shield of Massachusetts ("Blue Cross"). The six-year agreement will build on the success of the Hubway system and greatly expand access to bike share in the four municipalities. Blue Cross's support also will allow for upgrades to the system overall, including new bikes, new mobile app features, and more valet service to guarantee bikes at busy stations. 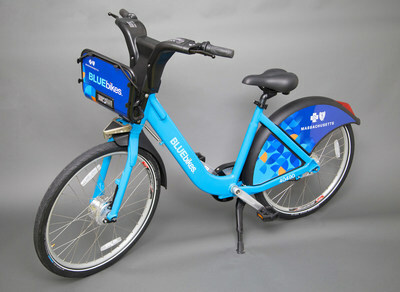 As part of the sponsorship, the existing system is being rebranded as Blue Bikes, reflecting Blue Cross's support for the bike share system, which will continue to be a municipally-owned, public transportation system and to be operated by Motivate International, Inc. By the end of 2019, there will be 3,000 Blue Bikes on the streets — up from the 1,800 that exist today — and more than 100 new stations throughout the four municipalities. "We're excited to get the new Blue Bikes out on the streets," said Andrew Dreyfus, president and CEO of Blue Cross Blue Shield of Massachusetts. "We think riders will be pleased with the improvements they'll see, and we hope to encourage new users to take a Blue Bike for a spin to school or work. We're proud to help expand bike share access across the metro region, since it aligns with our mission to help residents of the Commonwealth lead healthy lives." To celebrate the launch of Blue Bikes and National Bike to Work Day, Blue Cross will sponsor a "Free Ride Day" on Friday, May 18, to encourage new users to take the bikes for a spin free of charge. To participate, simply open the Blue Bikes app on a mobile device and select "Free Day Pass". Motivate is the largest operator of bike share systems in North America—operating in eight cities including several major urban centers. Working with cities, Motivate has helped bring the benefits of bike share to more urban residents and visitors. Learn more at www.motivateco.com.